Relaxing, comfortable and stylish, the Lay-Z-Spa Maldives HydroJet Pro™ sets a new standard for premium inflatable hot tubs. Featuring the brand new inflatable bench and seat with integrated feet massager, you can enjoy the blissful 40°C rapid heating system in total luxury. Complemented by the brand new Aqua Glow™ water powered LED lights, you can relish in the all-inclusive surroundings of the Lay-Z-Spa Maldives HydroJet Pro™. The Maldives also features the renowned Lay-Z-Spa Hydrodynamic massage system which includes 8 directional and flow-adjustable HydroJets™ and 140 all-surrounding AirJets™. Utilising the digitally controlled pump with soft-touch control panel, you can decide to combine both invigorating massage systems or experience them individually. Able to increase blood flow to injured areas, soothe muscles and relax joints, the massage system provides a host of benefits associated with Hydrotherapy. Brand new to the Lay-Z-Spa Maldives is the innovative integrated seating area with removable back rests. Providing an added layer of cushioning, this inflatable seating arrangement is great for those who want or need a little extra support during their Lay-Z-Spa sessions. With the ability to add or remove the inflatable back rests, you can configure the Maldives to create an ergonomic seating area that is right for you. Including the built-in feet massager, you can truly sit back, relax and indulge. Now you can enjoy a spectacular display of colour from the comfort of your Lay-Z-Spa with the brand new Aqua Glow™ water powered LED lights. Making your spa sessions even more enjoyable, the variety of soft ambient lighting colours make the mood just right. The Maldives’ intelligently designed pump is able to rapidly heat the water up to a blissful 40°C. Able to precisely select the temperature you desire using the digital pump, you can enter your spa knowing it is perfectly setup ready for you to enjoy. The pump's technology also enables you to heat the water, run the AirJet™ massage system and filter the water continuously. The integrated Power Saving Timer lets you control the Maldives’ heating system up to 72 hours in advance. Letting you select the time and duration of the heating cycle of the Maldives, you can enjoy the blissful 40°C heat at the time you desire without having to leave the heater on all the time. This is not only convenient it can also help reduce your heating costs dramatically. As part of this premium inflatable hot tub package it incorporates a sturdy I-Beam construction which when inflated provides a solid and dependable foundation. Its thoughtfully designed I-Beam construction also ensures the spa maintains its structural integrity even when inflated and deflated repeatedly between seasons. The 3-Ply reinforced TriTech™ material further enhances this strength, offering superior strength and durability without sacrificing on comfort or style. Relax in total comfort and be enveloped in luxury with the Lay-Z-Spa Maldives HydroJet Pro™. PLEASE NOTE: The fittings for the pump can be found in the top compartment of the pump. Simply lift the lid to reveal its contents. How easy is the Maldives HydroJet Pro to set up? Very easy! The Maldives HydroJet Pro only takes around 10 minutes to set up and up to 1-2 hours to fill with water depending on your water pressure. You inflate the Lay-Z-Spa using the pump and you don’t need any tools. We also have setup videos available to guide you through the process. How much does the Maldives HydroJet Pro cost to run? We estimate that it costs around *£7 - £10 a week to run the Maldives HydroJet Pro based on feedback we have had from our customers (*this is an estimate and does not take into consideration specifics such as electricity supplier and use frequency). Does the Maldives HydroJet Pro have a warranty & UK support team? Our standard warranty is 12 months on the pump and 6 months on the cover, liner and inflatable lid. This warranty can be extended (by registering on our website) to 24 months on the pump and 12 months on the cover, liner and inflatable lid. We have a free UK based support team who are fully trained to help Lay-Z-Spa owners. Does the Lay-Z-Spa Maldives HydroJet Pro plug into a normal UK socket? Yes, all Lay-Z-Spas are designed to plug into a standard UK 13amp/240V electrical supply. We advise that you always use an RCD protected socket (like those installed in your home) and not an extension lead. The Maldives HydroJet Pro comes with a 7 metre power cable. Do you need to put chemicals in the water? Yes, it is essential to use chemicals in your Lay-Z-Spa. We recommend ClearWater Chemicals which are designed with Lay-Z-Spas in mind. Read our Chemicals Guide for help with chemical maintenance. Can you put the Maldives HydroJet Pro indoors? Lay-Z-Spas are suitable for use both outdoors and indoors. Most of our customers set them up in their gardens on artificial or normal grass, on a patio or in a summer house. For use indoors, you should take particular time and care to consider factors such as drainage and ventilation. How long does the Maldives HydroJet Pro take for the water to heat up when you first fill it? This can vary depending on the temperature of fresh water that goes into your spa and the ambient air temperature. On a typical summer’s day in the UK, it can take on average 6-12 hours to heat the water to 40°C. Once the water is up to your desired temperature, the pump can be left on, efficiently heating the water. Where are the fittings for the pump? The fittings for the pump can be found in the compartment on the top of the pump. Simply lift the lid to reveal its contents. The Maldives HydroJet Pro hot tub comfortably fits 5-7 people. Relax and unwind with the soothing all surrounding Airjets & 8 Hydrojets. The hot tub heats up to a blissful 40°C. Our timer enables you to schedule your next hot tub session so it's ready for when you get home. Lay-Z-Spa is the world's first premium, inflatable hot tub and UK's bestselling hot tub brand.  Join our community of over 200,000 happy Lay-Z-Spa UK owners. All Lay-Z-Spa models are inflatable and portable. Requiring no professional installation or tools, they can be set up (using the included pump) in just 10 minutes! Every Lay-Z-Spas features either an AirJet™ or HydroJet™ Massage System, offering the ultimate relaxation. The digital control pump heats the water up to a blissful 40°C. With a decade of advanced engineering innovations and experience, we have the most trusted, innovative range of premium inflatable hot tubs in the world. All Lay-Z-Spas include an extendable 1 year warranty. We have a dedicated UK based Aftersales Support Team to help with your enquiries. If you spend £250 or more on the website, you will be eligible to apply for our Interest Free Finance option, meaning you can buy today and pay the balance over 6 or 12 months (minimum of 15% deposit required). Add products to basket - Find the products that you would like to purchase and add them to your shopping basket. Checkout - If the basket total is more than £250 you will be offered the option of using Close Brothers at the checkout. This is in addition to our normal payment methods that include credit/debit cards and PayPal. Credit Application - If you choose to finance your purchase you will be directed to a secure application process on Close Brothers' servers. You will be given the choice of 2 schemes. A calculator will be provided that will show the repayments and interest rates associated with the scheme you have selected. If you are approved for finance you will need to have your credit card ready to leave a deposit (minimum of 15%). You can then pay the remainder as monthly payments, with a loan duration of your choice. It depends on the scheme that you select when making the credit application. If you choose the 0% finance option then you pay no interest on your purchase. The monthly costs will be clearly shown to you in the application process so that you can decide on the scheme that best suits your needs. Based on: Agreement duration 6 months. Rate of Interest (Fixed) 0%. 0% APR Representative. Unfortunately applications from students, unemployed and single house persons will not be considered by Close Brothers. If you would like to read more about our finance option, then please visit our Finance page for further information.